It was the last Saturday on a hot summer day when a pigeon while taking off in flight was accidentally startled by a parked car that was merging out into traffic and then struck by a second moving vehicle that was speeding in traffic. My friend Isabel witnessed it all and she picked up the injured bird, that was now laying in the middle of the road, and brought into my shop. I having a list of wildlife rescue places logged on my phone and went into emergency mode calling my local animal rescue places, but on a late Saturday afternoon they were all gone for the day; so I did the next best thing I could do find a box and a cushion to lay the bird down to rest. It was obvious that this bird was in need of help, because it didn’t struggle to break free. The pigeon even accepted drops of water from Tatiana one of my clients that was visiting my shop at the time. Even the couple whose car had startled the bird onto the moving traffic graciously volunteered to take Isabel with the bird to the nearest veterinarian, but vets office was already closed for the day and they had to turn back to my shop with the injured bird. I was now faced with having to bring the bird home to let it rest over night in the hopes that it would make it through the night until my local veterinarian would reopen for service the very next day. The strange thing about the whole incident was that, although I like to watch birds in flight, I have always been afraid of any bird coming near me especially pigeons, and now I had one in my shop and it was going home with me. Well somehow I saw the need to put my fears aside and while Isabel held the bird in her hands I drove home. We placed the bird in its cushioned box with food and water and secured it in the garage over night. The next day when my husband was back from his morning cycling club ride he opened the garage door to put away his bicycle when he was greeted by a wobbling bird. 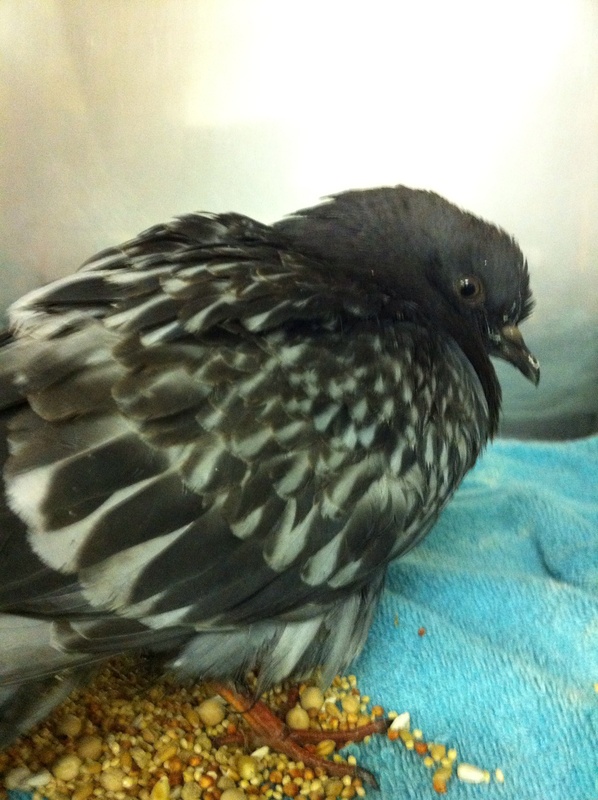 Although the pigeon looked better than the day before it still wasn’t ready to take fly, so I proceed with my plan to take it to my local veterinarian who also takes in wildlife. Needless to say mission accomplished the bird made it through its ordeal and was left recovering at the vets office.